I have had many thoughts about thanksgiving lately which have changed the way I write in my prayer journal. I have been starting out my morning prayers with writing out things for which I want to thank God. I'm not sure if that practice has made me more thankful, or if that is a result of being more thankful, but in either case it is a good way for me to start my day. One of the things I regularly am thanking God for is healing for Alex. It is amazing to see him look healthier almost every day and begin to catch up in the ways he was so delayed due to malnutrition and neglect. 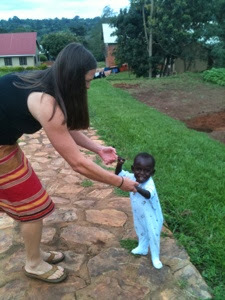 He is now walking when you hold his hands and smiling so much more! It melts my heart when I walk into Claudia's house and he smiles at me or reaches for me. Since many of you have been praying for him, I thought you would like this picture. See his beautiful smile? And his fuller checks and abdomen? He is doing so well! As I read many Facebook posts about fall weather, I have also been thinking about Thanksgiving Day. I know it is more than a month away, but things take a long time to pull together around here. I'm not sure about where we will celebrate, but we will try to have a thanksgiving type meal. Several items can be found here in Uganda that we would eat in a traditional American Thanksgiving dinner. There are turkeys around. Frozen ones are available in Kampala and live ones are sold many places. Not sure which we will do. I'll let you know if we chop the head off a live one. That would be a Thanksgiving to remember. Pumpkins are grown on campus at GSF and we can make pumpkin pie from one of those or one from the market. We can get potatoes for making mashed potatoes. There are some Ugandan sweet potatoes that grow here for making sweet potato casserole. I have not seen any Stove Top stuffing, which is my favorite, but I think some is on its way from America! We recently received some jello packets in the mail which will be a nice addition, maybe with pineapple pieces or something. Green beans are also sold in the market, and I may even have seen French fried onions in a supermarket once for green bean casserole. Can you tell I have been thinking about Thanksgiving Dinner? I think it will be a little taste of America if we can pull it all together. The only thing that would make it better is if family and friends from America could also be here to celebrate with us. Since food takes much more preparation and planning here in Uganda than it does in America, I find that I am thinking about it a lot. I am very thankful for all the good foods we have found here. We have learned to make more items from scratch, and have eaten many delicious meals. This morning I made pancakes and syrup from scratch along with cooking bacon. (I didn't slaughter and butcher the pig though.) David and I thought that maybe we would lose a little weight moving to Africa if we were always eating beans and rice and fresh fruits or vegetables, but that has not been the case. We have that meal sometimes, but there are so many other good meals we have eaten here. We are thankful for all the good food, but I guess now we will need self-discipline if we are going to lose weight. Bummer. But we do miss some food from America like Brett's quesadillas in Athens and Zaxby's chicken fingers. I try not to think of those things too much since that just leads to coveting rather than thankfulness. I am also thankful that we are working here at Good Shepherd's Fold. Each day as I walk across campus, I think how thankful I am to be a part of this ministry. I love sitting on the playground and having toddlers climb on my lap. I love that Danny, who is way to big to be held, still comes to me and I can pick him up and remind him that Jesus loves him. I love holding the precious babies! I love feeling how Alex is heavier each day! I love talking with the older children as the climb the trees for the mangos. I love giving hugs to the girls here with special needs. And I love teaching the missionary kids here! I have so much for which to be thankful. Some days I may forget, but I will keep writing it down to help me remember.